The Rage by Zeekio is a 12 panel handcrafted leather grain footbag with Pellet Fill. It has just the right pop and really comfortable feel. The Ghost is a handcrafted 14 panel synthetic leather Footbag with Pellet Fill. The FURY by Zeekio is a handcrafted 8 panel leather Footbag with Sand Fill. 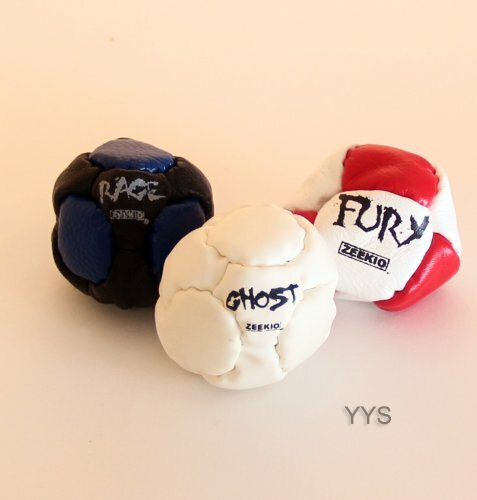 Set of 3 footbags by Zeekio. Colors vary. This item is leather and needs broke in for great play! If you have any questions about this product by Zeekio, contact us by completing and submitting the form below. If you are looking for a specif part number, please include it with your message.